Consistently, one Panzer Grenadier game has been harder to keep in print than any other: 1940: The Fall of France. That’s partly due to the way it was printed (there are no stockpiles of maps or game pieces), but mostly due to continued popularity. It’s not surprising. Philippe Léonard, a master of storytelling in game form, crafted a wonderful game based on the fighting in May and June 1940. We’re bringing it back into print with die-cut, silky-smooth game pieces, part of an eventual three-game set on the 1940 campaign. While the 1940 campaign is noted for the poor strategic performance of the French command and swift, decisive moves by the Germans, it’s very different on the tactical level. The French Army possessed many fine units, and these fought with fanatic courage and professional determination to hold back the Nazi hordes. France also had some less-than-determined defenders, who crumbled before the German onslaught. Philippe tells that story with 50 scenarios – no mere dozen can convey the full tale of 1940’s history-changing battles no matter how much hand-waving about “typical actions” accompanies them. Philippe's scenarios range from small, tense infantry fights on a single map to the huge tank battles fought in central Belgium in the opening days of the campaign. Most importantly, they show, rather than tell, why the Germans could slice their way through the world’s most powerful army in just six weeks – and that while France may have suffered a “strange defeat” for many reasons, lack of courage was not among them. You can read a scenario preview starting right here (it has several parts). They story that unfolds is made even easier to tell with the Fourth Edition rules for Panzer Grenadier. And there are now full-color play aids to make things even more fun. Best of all, the rules are fully backward-compatible: if you’re fortunate enough to already own 1940: The Fall of France, you can use the series rules out of one of the other new games to play its scenarios with no problems. You can read a preview of the Fourth Edition rules here. The game includes eight maps on which the story is told, all by Guy Riessen. They represent more built-up terrain than do the maps in most Panzer Grenadier games – France in 1940 was an urban, industrialized society. They are the usual Panzer Grenadier maps on heavy cardstock, 11x17 inches and interchangeable with the huge number of other maps currently in print (including those from Panzer Grenadier (Modern) and Infantry Attacks). You can see a preview of the game’s maps, and read about their design, here. The game introduces the French to Panzer Grenadier, complete with their angry chicken national symbol (more properly the “Gallic Rooster” or Chanteclair, but we always describe it as the “angry chicken” on internal art directions). The French Army suffers from the legacy of victory in the Great War; much of its artillery is the lightweight 75mm Model 1897 quick-firing gun. The “French 75” was touted as a war-winning weapon, but even in 1918 many generals felt they needed heavier metal to reduce enemy fortifications. Many thousands remained in service in 1940. The Germans, forced to scrap most of their equivalent 77mm light field guns, replaced them with much more effective 105mm weapons for the next war. New French weapons, like the 47mm APX anti-tank gun, are better than anything in the German arsenal but are only just starting to reach the troops. It’s a similar story with tanks. Forbidden to develop tanks under the Versailles Treaty, the Germans started later than the French. So on the one hand, the best French tanks (the Somua S35 and Char B1bis) are far more capable than the best German tanks. On the other, the Germans are not saddled with over-aged relics like the FT17 (just with PzI tankettes and useless PzII light tanks). In the categories of both tanks and heavy weapons, the French occupy a broader spectrum of quality than the Germans, better than the invaders on the top end, worse on the bottom end. You can read a preview of French armor pieces here. It doesn’t work that way when it comes to infantry, and to a great extent it would be the higher quality of their foot soldiers that would bring the Germans victory in the 1940 campaign. The French once again have a broad range of infantry types, though this time it’s because of the French Army’s reserve system rather than development and procurement drawn out over decades. The Germans have just one (plus special pieces for the Grossdeutschland Regiment). The French platoons are smaller and therefore weaker when on an even footing with the Germans, but only some French infantry is that good. Often, the French infantry is just plain terrible. You can read a preview of other French pieces here. 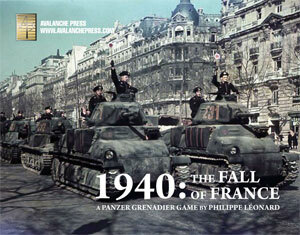 1940: The Fall of France is a core game of the Panzer Grenadier series. I’m really happy we can bring this game back into print along with the new games of the series’ Fourth Age. The new cover and the new rules make this a first-rate addition to your game shelf, and the fifty scenarios assure that you’ll be playing it a lot.